DAMASCUS, Syria Three suicide bombers detonated cars packed with explosives in a government-controlled area of the battleground Syrian city of Aleppo on Wednesday, killing at least 34 people, leveling buildings and trapping survivors under the rubble, state TV said. More than 120 people were injured, the government said. A fourth explosion a few hundred yards away struck near the edge of the Old City, a UNESCO World Heritage site that has been heavily damaged during more than two months of fierce fighting between rebels and government forces for control of the Aleppo. There was no immediate claim of responsibility, but the government blamed its opponents and said the blasts were caused by suicide bombers. The technique is a signature style of al-Qaida-style jihadist groups, some of which are known to have entered Syria's civil war to fight against the regime. Syria: U.N. Council members backing "terrorism"
The transformation of Syria's conflict into an open war has given an opening to foreign fighters and extremists, analysts say. The Syrian government has always blamed the uprising on foreign terrorists, even though the revolt began as peaceful protests by ordinary citizens that turned violent after repeated attacks by security forces. The Syrian opposition denies any links to terrorists or any use of suicide attacks. A Sunni extremist group called Jabhat al-Nusra, or Victory Front, has claimed responsibility for previous bombings. Rebels last week announced a new concerted push to capture Aleppo, where they have been battling with regime troops since July. Syria's largest city and a major commercial hub, Aleppo was for a long time free of the violence that engulfed much of the rest of the country, but now has been devastated as rebels try to wrest a major strategic prize from the regime of President Bashar Assad. The bloodshed also is increasingly spreading outside Syria's borders. On Wednesday, a shell fired from inside Syria landed on a home in neighboring Turkey, killing at least three people, including a 6-year-old boy, said Abdulhakim Ayhan, mayor of the Turkish town of Akcakale. Turkey's state-owned Anadolu Agency reported angry townspeople marched to the mayor's office to protest the deaths. In Aleppo, footage broadcast on state-run Ikhbariya TV showed massive damage around Saadallah al-Jabri Square, which also houses a famous hotel and a coffee shop that had been popular with regime forces. One building appeared to have been leveled to the ground. The facade of another was heavily damaged. The station showed video of several bodies, including one being pulled from the rubble of a collapsed building. Rescue workers stood atop piles of concrete and debris, frantically trying to pull out survivors. Syria's state-run SANA news agency said the bombings early Wednesday killed at least 34 people and wounded 122, blaming the attack on "terrorists." "It was like a series of earthquakes," a shaken resident told The Associated Press by telephone. "It was terrifying, terrifying." The resident said the officers' club and the hotel were almost completely destroyed. His account could not be immediately verified. The resident declined to be identified for fear of reprisals. Activists could not reach the area, which is controlled by security forces and sealed off with checkpoints. A Syrian government official said the number of deaths would likely increase because many of the wounded were in critical condition. Regime troops killed two more would-be suicide bombers before they could detonate their explosives, he said on condition of anonymity in line with government regulations. Syrian state TV showed the bodies of three men wearing army uniforms at the site of the explosions. One of them appeared to be wearing an explosive belt with a timer tied to his wrist. Aleppo-based activist Mohammad Saeed said the explosions went off minutes apart at one of the city's main squares. He said the blasts appeared to have been caused by car bombs and were followed by clashes and heavy gunfire. "The area is heavily fortified by security and the presence of shabiha," he said, referring to pro-regime gunmen. "It makes you wonder how car bombs could reach there." Activists and Syrian state media said a fourth car bomb went off in the Bab Jnein area near the Old City where the Chamber of Commerce is located. It was not immediately clear how many casualties there were from that blast. The Britain-based Syrian Observatory for Human Rights, which relies on a network of activists on the ground, said at least 40 people were killed and around 90 wounded in the four blasts, most of them members of the regime forces. It said mortars also targeted the nearby political security department around the same time of the bombings. The Syrian security official, however, said most of Wednesday's casualties were civilians. "We condemn these crimes and this terrorist explosion and we also condemn the countries that conspire against Syria and stand behind the terrorists," the speaker of the Syrian parliament, Mohammad Jihad al-Lahham, told the assembly Wednesday. During the course of the 18-month-uprising against Assad, suicide and car bombings targeting security agencies and soldiers have become common in Syria, particularly in the capital, Damascus. But Aleppo had been spared from such bombings and from the mayhem that struck other Syrian cities, particularly in the first year of the revolt. 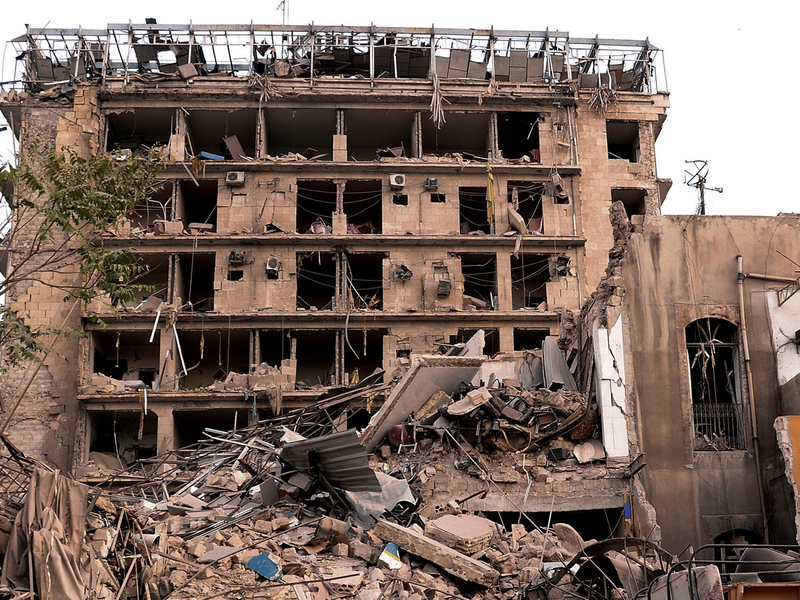 Then, in February, two suicide car bombers hit security compounds in Aleppo's industrial center, killing 28 people. The uprising against Assad erupted in March 2011 and gradually morphed into a bloody civil war. The conflict has killed more than 30,000 people, activists say, and has devastated entire neighborhoods in Syria's main cities, including Aleppo. The city, one of the world's oldest continuously inhabited cities, has been the site of fierce battles for more than two months between regime troops and rebels fighters that have brought relentless shelling and gun battles. Over the weekend, a fire sparked by fighting tore through the city's centuries-old covered market in the Old City, burning over 500 shops. At 7.5 miles, it is the Middle East's longest souk and is part of Aleppo's old center that was added in 1986 to UNESCO's list of World Heritage sites.